Dream of water, of sunsets, of rain. trapped in a karma created by their own hypnosis. Dream of density, of fusion, of limbo. playing hopscotch in the water. Dream of Rincon sunsets, of Matzathan nights, of Iberian dreams. another weird trip of high density intensity. 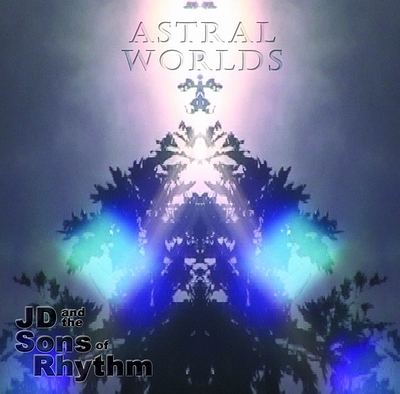 Astral Worlds is double CD number eleven from J.D. and the Sons of Rhythm, a fact which shows the depth and range of creativity from which this collective improvisation ensemble draws. Although there are similar starting points for textures and grooves, each of the previous ten CDs adds its own unique signature to the series. Different configurations of players, particularly bass players, and layered overdubs, create as much contrast as changing a tempo or rhythm pattern. Astral Worlds is no exception to this, keeping the live studio jams alive, changing between four different bass players, combining players in different ways, and presenting five highly unique and original overdubbed tracks. Trance-like grooves follow funky rhythms, with fast romps cascading into thoughtful adagios and precise articulation contrasted by the wailings of soaring souls. Phil's saxophone returns, violinist Chris Sedelmyer joins the mix, Preach Freedom of One World Tribe adds some Jembe, and for the first time since track 7 of Family Values a new keyboard player jumps in, Mark DeWalt of Catro Jazz Band. These additional sounds add new colors, ideas and personal styles to the mix. Of course, the regulars return to build on the familiarity and experience developed over four years of collective improvisation. J.D. and sons keep their playing fresh by playing together constantly between recordings, with Jayson also playing with Joe Frisina in Too Big Power, and Rickie now playing with Mike and Ralph in Swerve. Jayson's drumming with Too Big Power is superb; Joe and Frank join him on their first upcoming release, Ride A Wave, which is being mastered now at Midtown Recording Studios where J.D. and the Sons of Rhythm also record. After coming off of a four-year stint as Mambo's rhythm section, Rickie and Ralph have become a unit, playing tight in whatever situation they find themselves. Joel Polacci, also of Mambo, adds his congas to the rhythm on three Astral Worlds tracks. All four bassists have work on previous CDs, with David, Tony, Kenny and Ralph all keeping the floor of the groove intact. Sheldon and Mike of Potato Battery bring their interactive playing to the table, and guitar-guitar/synth-keyboard-bass-player Frank Singer jumps from instrument to instrument, often within the same jam. Singer plays acoustic guitar on several cuts, adding another dimension to the deep layers of J.D. and the Sons of Rhythm. All together, this cast of skilled and experienced performers allow themselves to once again be subjected to the scrutiny of unrehearsed ensemble playing with a high degree of success. As one of the musicians put it, "We forget how difficult this is until a new player comes in, and you see that look of vague panic as we just start recording as soon as J.D. starts playing, without any discussion about what's coming!" Fortunately, they all seem to adjust pretty quickly, and put themselves deeply enough into the music to transport you....to Astral Worlds. Astral Worlds opens up with The River Calls, the first of five overdub cuts by the trio of J.D., Jayson and Frank. Far Eastern percussion sounds play a trance-like rhythm with layers of mournful tones and a melodic flute as the journey begins. Iberians Dreams, Tony's first track of the disc, also introduces violinist Chris Sedelmyer and Frank's acoustic guitar, as Rickie, Phil and Sheldon add their voices to the music. This moody funk groove has more of a jazz-R&B rhythm feel, with the Eastern sounds moved to the melodies and harmonies above. World-Beat 6/8 Hypnosis was created by the same group of players as Iberian Dreams, with the introduction of keyboardist Mark DeWalt. Accents shift and rise to the surface as 3/4 is layered over the 6/8, and then a straight four-count layer gentles the music into a live fade. Ralph takes over the bass chair as he and Ricky put the Funk in Punkadylics, and Frank rocks out on distorted rhythm while Chris and Sheldon plays highlights and melodies. Mike finally joins in for his first cut of the CD, soaring above the groove with cascading tones and harmonics, followed by Frank as he finally leaves the rhythm and shreds the path to the jam's conclusion. Mad Rickie leads the way in a Billy Cobham/Steve Gadd-style funky double-time waltz, with Frank starting out on a trombone sound, and Tony back on bass with Phil replacing Sheldon in the lineup, and percussionists Joel Polacci and Preach Freedom making their first appearances. Mike keeps harmony as Phil counterpoints Frank's melodies, then Frank moves to electric piano as Phil plays chase, with Mike wailing into the mix with his lead sound, closing with an Allman Brothers-like cadence. J.D., Jayson and Frank begin the cycle anew in Water Falls, a World-Beat 6/8 tribal groove with acoustic guitar, and vocal-mallet and wood-flute synth-sounds. The acoustic guitar rises to the surface, submerges, and rises again as this liquid groove cadences in a ritardando. A quick fade-in brings the rest of the band back for Crusin' Through the Rain, with Frank continuing on acoustic guitar, Sheldon taking over for Mike on electric-guitar, Rickie and Tony holding down the rhythm section, and Phil, Chris and Mark back for another large-collective jam. We hear from Sheldon as this dreamy Weather Report-like medium-swing groove fades out and into Fusion Musak. The band shrinks by one as Singer takes over the keyboard chair on clavinet, with Mike coming in for Phil and Ralph back in place of Tony for some funky layered rhythms with Rickie. Frank and Chris dialog as bass and drums play the funk out of the 'fusion' groove. Mike soars in at the end, fading in as the track fades out and into Asylums. Phil returns in Chris' place, with David taking up the bass. Sheldon plays us in as Ohm keeps melodic harmonies in the Astral Plane and Singer fills with electric piano. After one of the longer recorded Peterson solos, Phil leads the melody into the rubato section, with Frank's chords and Rickie's drums shaping the phrases into the fade. A quick fade brings us into Ode to Kennedy Thompson (of One World Tribe), a ballad beginning with Tony on bass, Mike on electric guitar, Frank on violin-sound (synth), Preach Freedom on Jembe, Joel Polacci on congas, J.D. always at the helm and Rickie on traps with Jayson on break, and Phil taking over the melody as the song develops. Frank moves over to clavinet-sound (keyboards) as Phil brings the clarinet in, Mike's guitar rhythm moves the harmony as a Samba feel bubbles to the surface, then lays back only to resurface again. This gentle sway mellows into the final fade and end of side one. Side two opens with Lowdown Phunk, the third overdub session with J.D., Jayson and Frank. Keyboard bass supports Jayson's electronic melody, heralding the entrance of distorted guitar and a Miles Davis-like trumpet sound (guitar-synth) over the Phunky Hopkins beat. Hopscotch gives Jayson another break as Rickie returns, along with Sheldon, Phil, Chris, Mark, Frank on acoustic guitar, and Tony on bass. This World-Beat Funk groove bubbles with layered melodies, keeping a light rhythmic churn until the music naturally concludes, cueing the fade into the extended jam Reentry. This half-hour live jam session begins with J.D., Rickie, Joel and Tony in the rhythm section, Mike on guitar with multiple effects at certain points, Phil on sax and Frank beginning the jam with a trombone sound (guitar-synth). A pedal-point funk feel dissolves into a band cadenza as Mike plays an echoing rhythm with sax over the top. Rickie works the snare as the band creates rhythmic layers until funk emerges from the fractal snippets of melody. Frank returns with soprano (guitar-synth) and dialogues with Mike and Rickie as J.D., Joel and Tony groove and Phil joins in. Frank layers guitar in fives and sevens as Mike takes the lead. After a rubato section, Frank and Phil play a chase section leading into a mellow funk groove. After several more transformations, Reentry brings us back to Earth and the next overdub cut. J.D., Jayson and Frank discuss Strange Dreams Again with Jayson's electronic drum sounds adding to the spaciness of the echoing keyboard sounds. This Weather Report-like texture crescendos its oceanic surges, then fades into The Living Is Easy. Phil's clarinet sings us into a vintage J.D. jam, with the Hopkins' and Tony in the rhythm section, Frank on acoustic guitar, and Sheldon, Mark and Chris. The etheric funk seems to suggest Gershwin's Summertime as melodic fragments echo and answer each other. Mark adds some tasty lines, building to a climax, then letting down into a rubato acoustic guitar cadenza and some extended drum work. High Density Intensity opens into Kenny's bass drive, then erupts into Fusion-Rock as Mike soars over Sheldon, Frank, J.D., Jayson, and Rickie's furious drumming. Frank jumps into conversation with Mike while swing, free-jazz and drum-rolls paint the textures, leading into a protracted cadenza with Sheldon and Kenny joining in as well, leading up to the final chord. Matzathan Nights fades us back into the groove, with Frank's guitar solo leading us in over a rhythm section of Ralph on bass and the three Hopkins drum/percussionists, and melodic harmonies from Mike, Sheldon and Chris. As the music falls from a crest, we hear from Chris on a sweet-sounding violin solo, leading to the fade as Mike takes us out and into the fifth overdubbed trio cut. Another Weird Trip lands us in a gamelon-esque tribal World-Beat rhythm, with a keyboard mallet-sound melody playing counterpoint into the fade. The full band returns for Rincon Sunsets, the final cut, with Ralph on bass, and Mike, Sheldon and Chris keeping the counterpoint to Frank's guitar-organ (guitar-synth) doubled-sound melodic improvisation. Chris plays an interlude, followed by Mike who plays us into the fade. Astral Worlds portrays a variety of sounds, from this breezy funk feel at the end to the pressure of High Density Intensity to the multiple transformations of Reentry. Many aspects of the dream are covered, as you project through Astral Worlds' portrayals of these realms, and eventually return refreshed, delighted with the world you're in. ASTRAL WORLDS, 19 tracks of music on 2 discs.